This policy sets out the various scenarios in which we would we using your cookies. Cookies are small alphanumeric texts that are stored in the storage module of your devices. They are often used to help the website visitor derive a personalized experience on the website being visited. These are also used at times to understand the browsing activity and preferences of a visitor on the website, or how the user is engaging on the website. Cookies are stored on the visitor’s browser and can be deleted any time by the user without our consent. 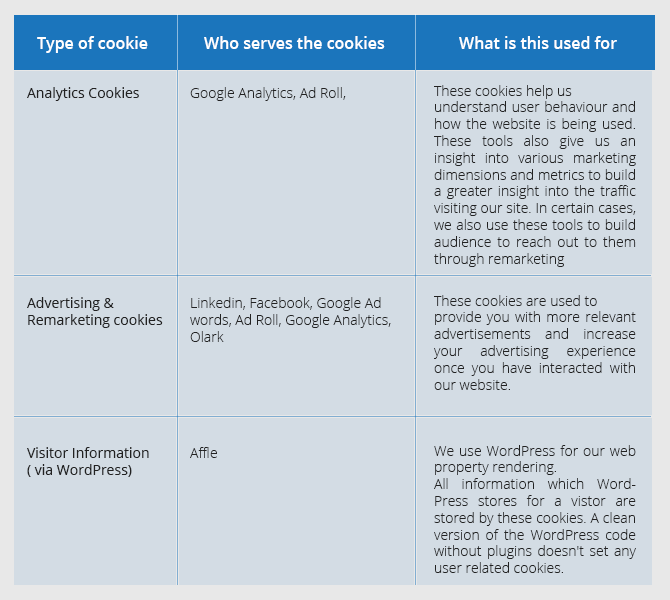 Also note, it is advisable to accept cookies in order for you to have a more enriched browsing experience. In other cases, not accepting might not render the web pages efficiently.